(Indianapolis) Jewish Post, December 2, 1938, 1, accessed Hoosier State Chronicles. Fortune, July 1938, reprinted in Ishaan Thardoor, “What Americans Though of Jewish Refugees on the Eve of World War II,” Washington Post, November 17, 2015, accessed Washington Post. Again, the staggering statistics can be numbing. But even at our most ambivalent, the stories of children fleeing persecution seem to break through our indifference and stir us to act. For example, in 1938, British citizens lobbied their government to act on behalf on children fleeing Austria and Germany after the Anschluss and Kristallnacht. They agreed to fund the transportation, care, and education of these children and infants. 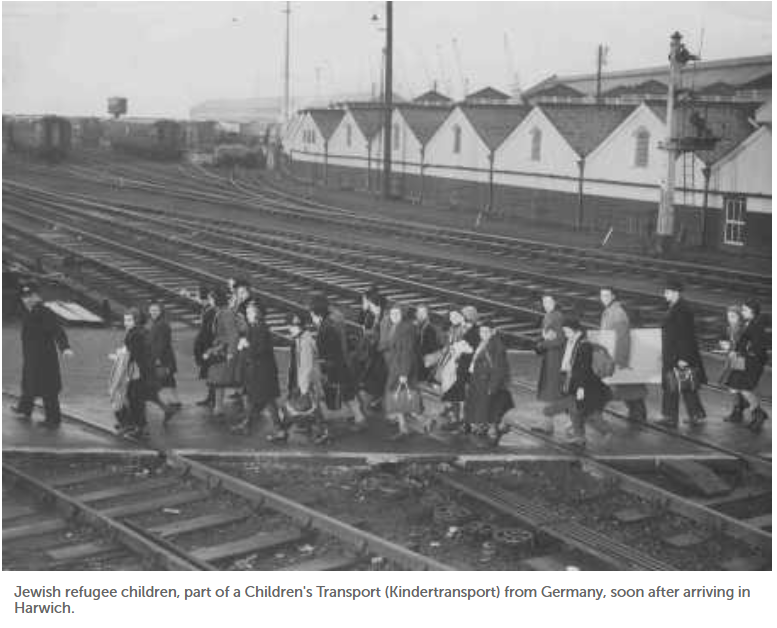 These rescue missions, known as Kindertransport, saved ten thousand children from annihilation. 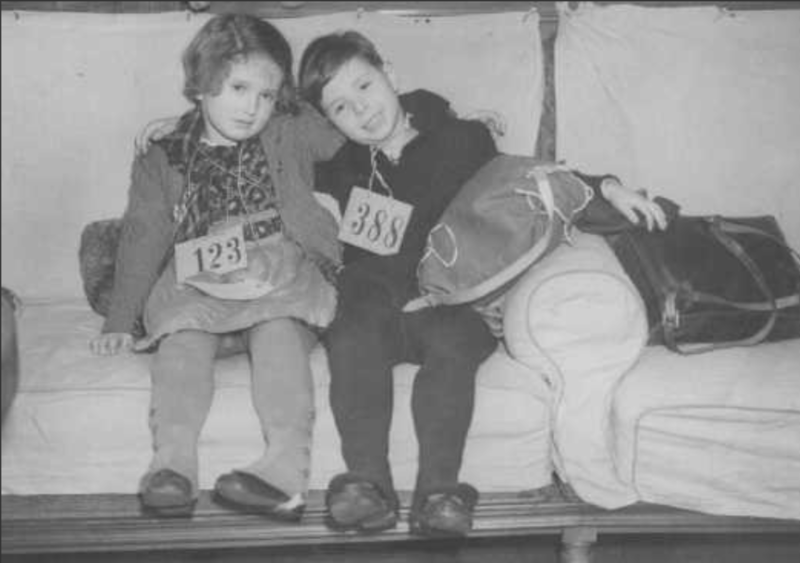 USHMM caption: Jewish refugee children, part of a Children’s Transport (Kindertransport) from Germany, upon arrival in Harwich. Great Britain, December 12, 1938, Institute of Contemporary History and Wiener Library Limited, accessed Holocaust Encyclopedia, USHMM. The admission of a handful of unfortunate people means little in the economic life of 120 million people, but it means a great deal for us and the world as a symbol of the strength of democratic convictions and our common faith. 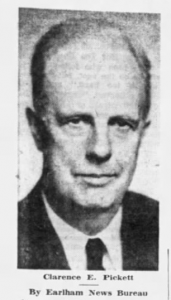 (Indianapolis) Jewish Post, June 2, 1939, 6, accessed Hoosier State Chronicles. I hope very much it will pass. It seems to be a wise way to do a humanitarian thing. At the same time in Indiana, several notable Hoosiers were at work on grassroots campaigns to rescue German-Jewish children. Prominent Jewish civic leader Sarah Wolf Goodman and the leadership of the (Indianapolis) Jewish Post, among others, raised money to bring refugees to the United States. We examined these efforts thoroughly in post 5 of this series “Jewish Refugees, Hoosier Rescue.” But these were small-scale operations. The sweeping action needed had to come from the federal government. 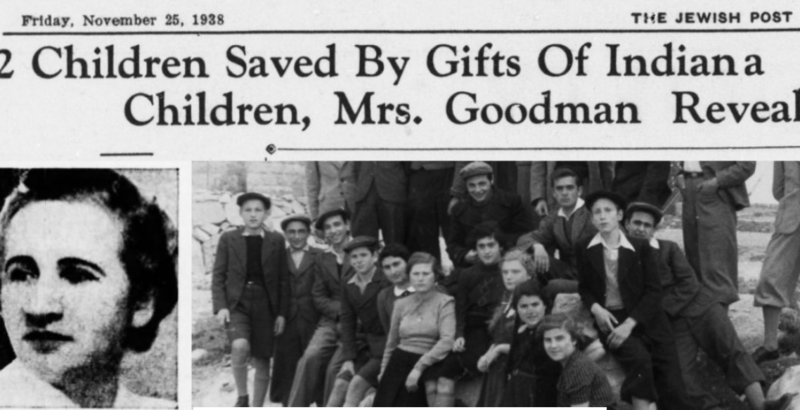 History Unfolded Post 5: “Jewish Refugees, Hoosier Rescue,” Hoosier State Chronicles Blog. 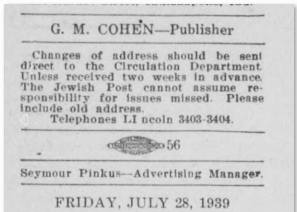 (Indianapolis) Jewish Post, July 28, 1939, 8, accessed Hoosier State Chronicles. 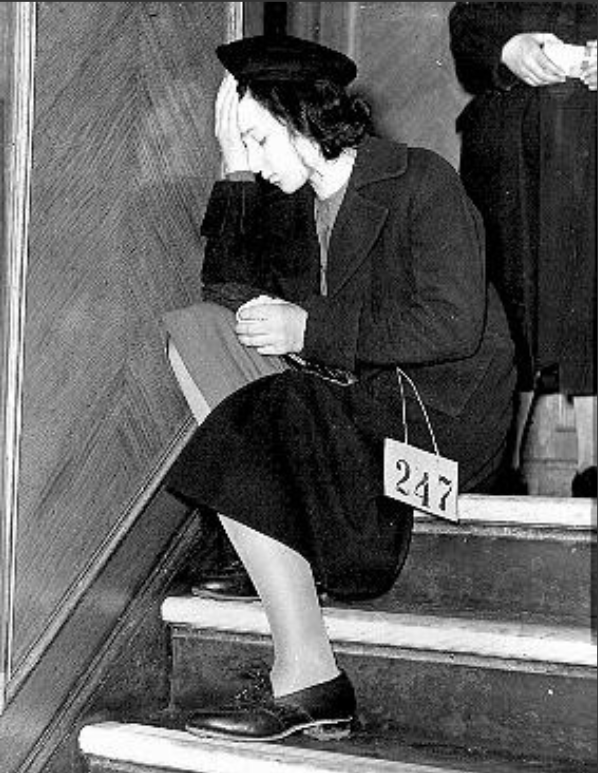 USHMM caption: A Jewish refugee girl from Vienna, Austria, upon arrival in Harwich after her arrival in England on a Kindertransport. United Kingdom, December 12, 1938, National Archives and Records Administration, College Park, MD, accessed Holocaust Encyclopedia, USHMM. Possibly such a demand cannot at this time come from the President. It can and should come, however, from the conscience of the American people. We are certain that there are thousands of Jewish families in the United States, who, in the face of the present crisis, will gladly take refugee children into their homes and provide them with food and shelter as long as necessary. Cohen’s prediction was correct. The JTA reported that at an April 1939 joint committee hearing for the bill, attorney Wilbur Large presented 1,400 letters from citizens around the country offering to adopt a refugee child. 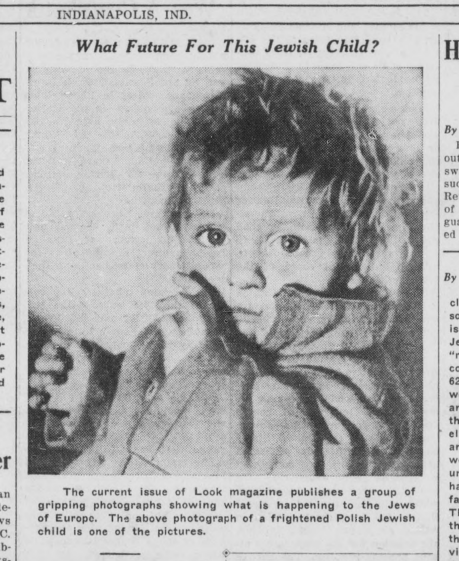 In fact, the AP reported that Paul Belsser, head of the Child Welfare League of America testified that there were more than enough homes for the children with twelve applications coming in for every child adopted in America. There is room in my family for one more. I beg you to let them in. Whatever economic objections and fears of increased unemployment Congress may have with regard to enlarging the existing immigration quota, there can be no such objections to the admission of children. USHMM caption: Children aboard the President Harding look at the Statue of Liberty as they pull into New York harbor. 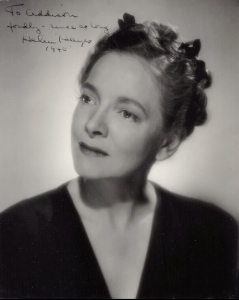 They were brought to the United States by Gilbert and Eleanor Kraus. New York, United States, June 1939, US Holocaust Memorial Museum, courtesy of Steve Pressman, accessed Holocaust Encyclopedia, USHMM. Again, Cohen’s predictions were correct. The bill’s opposition focused on the “economic dangers” of increasing immigration just as the country was climbing out of the Great Depression. Senator Robert R. Reynolds (D-NC) argued that the children would grow up and “undoubtedly keep our own children from jobs and work that they are rightfully entitled to.” Reynolds pledged to “filibuster the plan to death,” according to the Associated Press (AP). 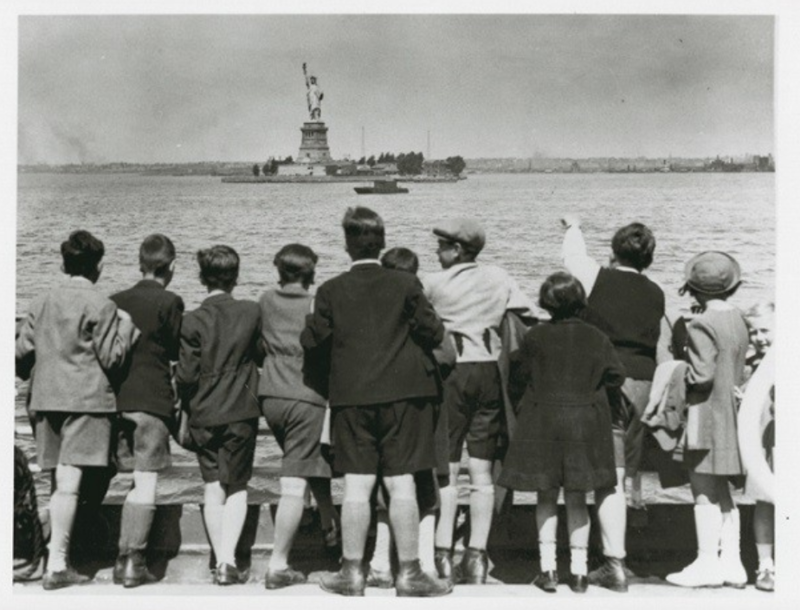 Some members of the immigration committee were reported to be favoring the admission of the children for humanitarian purposes while others were opposing it on the grounds American children would suffer by the influx of additional foreigners. We should solve this problem at home before extending a helping hand to foreign nations. 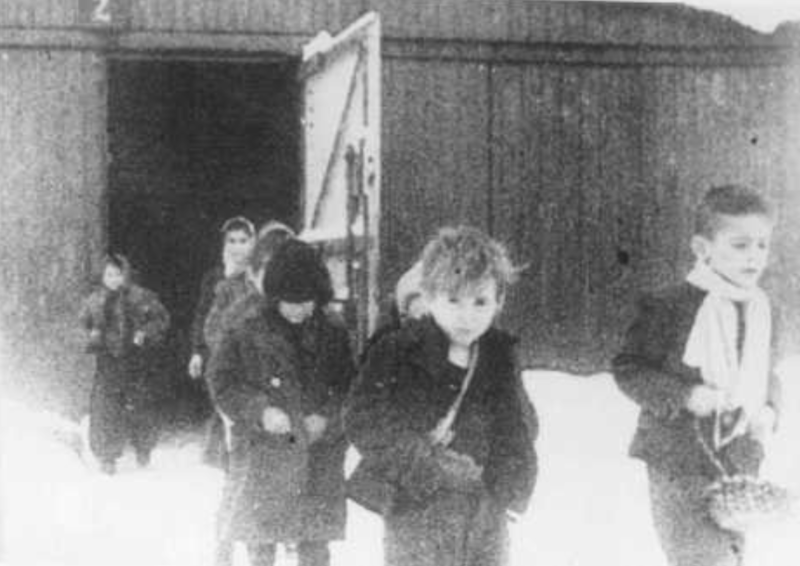 USHMM caption: Soon after liberation, surviving children of the Auschwitz camp walk out of the children’s barracks. 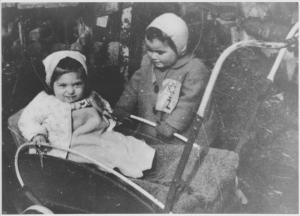 Poland, after January 27, 1945, US Holocaust Memorial Museum, courtesy of Lydia Chagoll, accessed Holocaust Encyclopedia, USHMM. USHMM caption: A child wears the compulsory Jewish badge. The “Z” stands for the word “Jew” (Zidov) in Croatian. Yugoslavia, ca. 1941, accessed Holocaust Encyclopedia, USHMM. Speaking of refugees, Senator Bob Reynolds, of North Carolina, who sees the overthrow of the republic if 20,000 refugee children are allowed to enter this country in the space of two years, has just opened a new headquarters for his organization, The Vindicators, here in Washington. It’s right behind the Supreme Court Building, and cost $20,000. I wish to say — and I say it without the slightest hesitation — that if I had my way about it at this hour, I would today build a wall about the United States so high and so secure that not a single alien or foreign refugee from any country upon the face of this earth could possibly scale or ascend it. 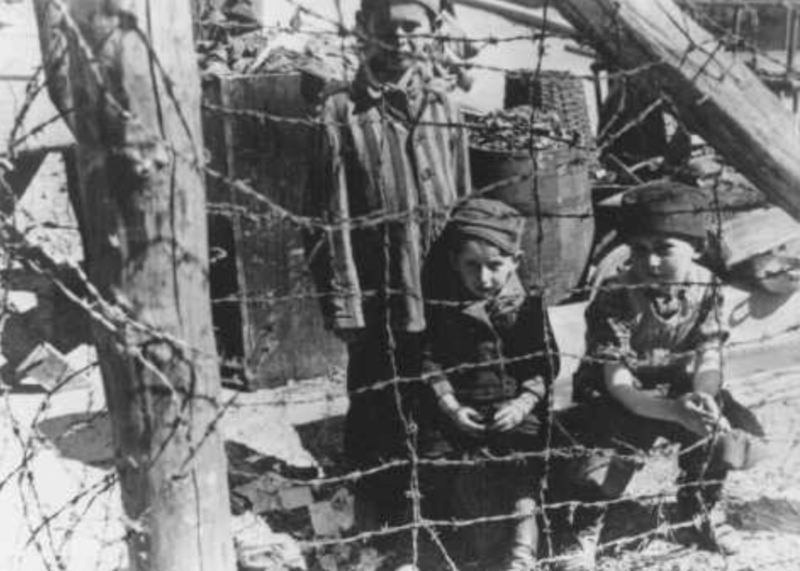 USHMM caption: This photograph taken soon after liberation shows young camp survivors from Buchenwald’s “Children’s Block 66″—a special barracks for children. Germany, after April 11, 1945, Federation Nationale des Deportes et Internes Resistants et Patriots, accessed Holocaust Encyclopedia, USHMM. Tens of thousands of innocent children are now exposed to a life of torture or to a slow painful death . . . America must do its share. Let us open our gates to their outstretched hands. Learn more about the History Unfolded project and about issues facing Refugees Today through the United States Holocaust Memorial Museum. United States Holocaust Memorial Museum, “Refugees Today,” Holocaust Encyclopedia, https://encyclopedia.ushmm.org/content/en/article/refugees-today. United States Holocaust Memorial Museum, “Refugees” Holocaust Encyclopedia, https://encyclopedia.ushmm.org/content/en/article/refugees. 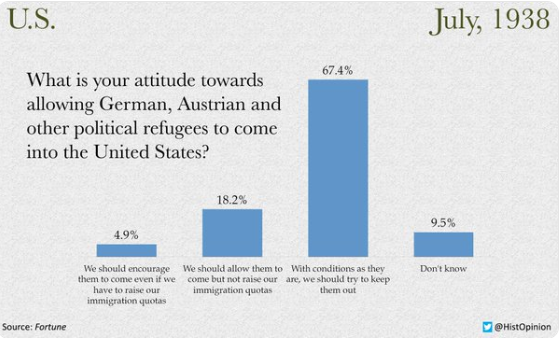 Poll: , Fortune, July 1938, reprinted in Ishaan Thardoor, “What Americans Though of Jewish Refugees on the Eve of World War II,” Washington Post, November 17, 2015, accessed https://www.washingtonpost.com/news/worldviews/wp/2015/11/17/what-americans-thought-of-jewish-refugees-on-the-eve-of-world-war-ii/?utm_term=.2a6a6f677323. United States Holocaust Memorial Museum,” Wagner-Rogers Bill,” Holocaust Encyclopedia, https://encyclopedia.ushmm.org/content/en/article/wagner-rogers-bill. Richard Breitman, Barbara McDonald Stewart, and Severin Hochberg, eds., Refugees and Rescue: The Diaries and Papers of James G. McDonald, 1935-1945 (Indianapolis and Bloomington: Indiana University Press, Published in Association with the United States Holocaust Memorial Museum, Washington D.C., 2009), 160-161.